Homemade soup is pretty much the solution to every problem. Sick? Soup. Lazy? Soup. Cold? Soup. I don’t know about y’all, but once it gets cold outside, I crave soup more than anything else. If I’m going to get out from under the covers to make dinner, you better believe it’s going to be easy. I’m not a huge fan of the canned stuff, so I rounded up some fresh, homemade versions that are almost just as simple. Drumroll please… three soup-er easy (ha, get it) recipes. They all have only five ingredients and take less than a half hour to make. Now we’re talking. A time-honored favorite, guaranteed to conjure up memories of your childhood. If you want to get really gourmet, accompany this creamy classic with a grilled cheese sandwich. 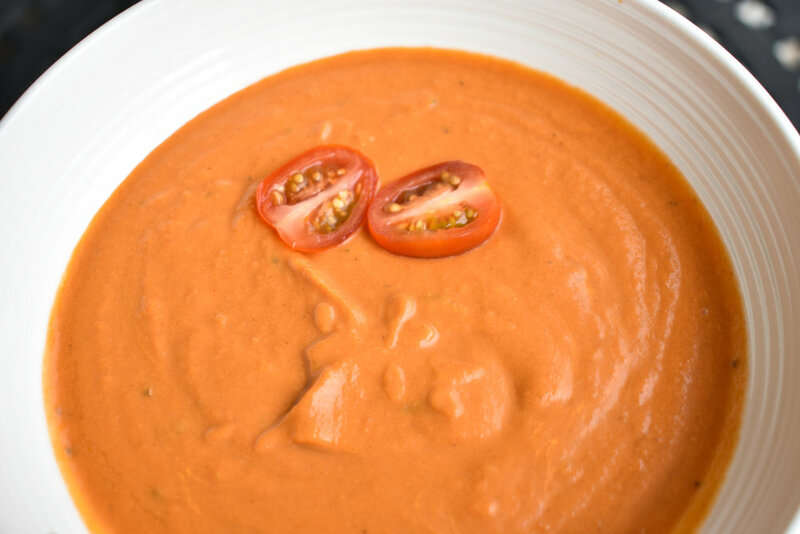 Meanwhile add canned tomatoes along with the juices to a blender and process until well pureed (if you like your soup with more texture you can go ahead and leave some small chunks). Add garlic to pot, and sauté 30 seconds. Then, pour in tomatoes and chicken stock, and bring to a gentle bubble. Reduce heat and simmer 10 minutes. Stir in half of the basil, season with salt and pepper if desired. Top with remaining basil, if desired. This is arguably easier than getting in the car and driving to Panera. Stir together stock, diced onion, and broccoli in a medium saucepan. Heat over medium heat until it comes to a low boil. Reduce heat to medium, and continue boiling for about five minutes, or until the onions are tender. Stir in the evaporated milk, and continue cooking for three minutes or until the mixture returns to a simmer. Remove from heat, and stir in the cheese until melted. Season soup with salt and pepper to taste. Does this qualify as a soup? I’m not really sure, but it’s good, so who cares? Add chicken stock, shredded chicken, beans, salsa, and cumin to a large stockpot, and stir to combine. Heat over medium-high heat until boiling, then cover and reduce heat to medium-low, and simmer for at least 5 minutes. Taste, and season with salt and pepper, if needed. Serve warm with desired toppings. Sidenote: You have my full permission to GO HAM on the toppings with this recipe. Diced avocado, chopped fresh cilantro, shredded cheese, chopped green onions, sour cream, crumbled tortilla chips, I want it alllllll. Grab a pot and get cooking — cost-effective, nutritious, and easy. You’d be stew-pid not to. Okay, I’m done now. Did you try any of these recipes? Let us know on social, @AuburnCampusRec. Born and raised in the D.C. Metro Area, Kyleigh somehow found herself 750 miles from home in Auburn, Alabama. She is a junior majoring in public relations. Passionate about health and wellness and interested in marketing, working at The Rec is the perfect fit for her. Outside of work, Kyleigh is working towards big goals, like visiting all 50 states before she’s 25, becoming a yoga instructor, and living and working abroad. When she’s not daydreaming about the future, she can be found in yoga class, visiting the cows off Lem Morrison, making sure her friends are fed, or crawling in bed at 8 p.m. She doesn’t exactly know what she wants to do when she graduates, but she knows it won’t be boring.